on April 17, 2018 and modified on April 17, 2018. 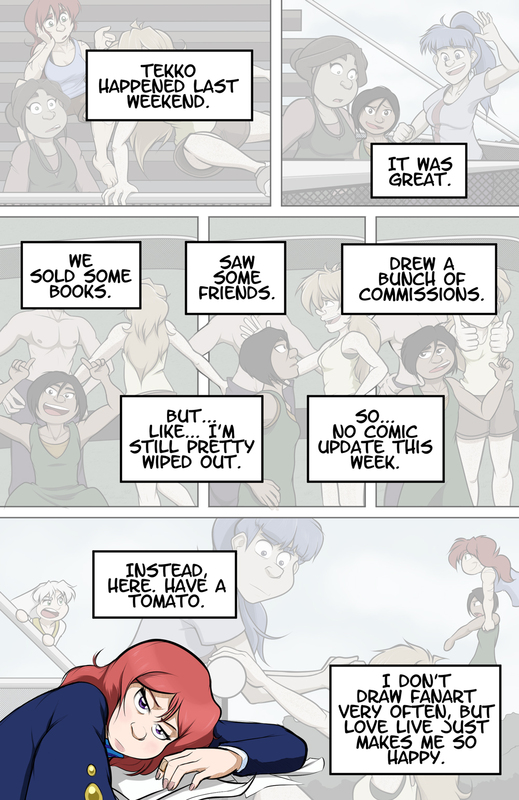 In case you missed it, there was an April Fools post and then a post-Tekko apology page that was pretty much the same page with a tomato guest star. Should be back on track now. Poor Sarah. That first panel just *tears* your heart out. Amazing characterization, there, dude. <3 Thanks. Expressions are really the only thing I take much pride in. Dude, have you looked around here lately? You’ve got a LOT to be proud of. You are weaving a great story here. You’ve got great characters that YOU’VE come up with and you’re making them VERY 3-dimensional and real. You’ve got all of us hanging on your every update. You’re a nice guy and open to my petty criticisms. “Expressions” are a very small part of all of that. Pfah. Wanted to wait until I was in a better head space to respond to this, so sorry for the wait! You kinda took me off guard with this one. I’ll admit that I don’t really give myself much credit when it comes to the writing aspect of the story. See, like, my writing style pretty much consists of having some basic ideas that drive the plot along and then letting the characters write themselves. It feels a little weird to take credit for their ideas, which might be a little on the crazy side, but here we are. I totally wasn’t being down on myself when I was saying that about the expression work, just honest. On average, I get maybe five minutes tops of that satisfied “I did the thing!” feeling before my brain decides that’s enough and cuts off the victory juice. Sometimes I’ll get a refresher from looking at a thing I’m particularly proud of or reading comments, but most of the time I’m just working to keep the anxiety of the story never getting told away. Most of the art has loads of technical and anatomical issues that drive me nuts to look at, but with the expressions, there’s a lot more lee-way with the rules given the style I’ve developed. So, since I’m usually just irritated with my backgrounds and most of my gesture work, it’s the faces that keep hitting that satisfaction button for me. It’s not always that way, just more often than not. Long story short (too late! ), I don’t want you to think I’m being down on myself when I say things like that. With the writing, I’ve got a mostly laissez-faire attitude that feels odd to take credit for and with the art I’m just not meeting my own ever-increasing standards… and that’s mostly due to time issues. Pride doesn’t often come into play just because my brain doesn’t really work that way. Also, your “petty criticisms” have made the comic better and I really appreciate them!! Seriously some of the highlights of my week. The writing aspect of the story is actually only part of it when you’re talking graphics. It’s an important part, yea, because the story lives and dies on how you write it– that’s why Pixar had 6 home runs in a row when they got started– they paid attention to story over everything. The thing is, this is coming from the heart, from what you say– and that means it’s just gonna flow. Just because the story is flowing freely, from the heart, doesn’t mean it’s not your creative juices powering it. It’s just how things work when you live what you love. Steve Jobs said “You’ve got to find what you love. And that is as true for your work as it is for your lovers. Your work is going to fill a large part of your life, and the only way to be truly satisfied is to do what you believe is great work. And the only way to do great work is to love what you do.” My wife worked with Steve when he was alive– and he truly believed these words. This is what you love, and that’s why it’s so easy for you. Doesn’t mean you don’t get to take credit for it. Ash is gonna be *mortified* when she realizes how much she just hurt Sarah. She has a good heart. She would *never* hurt Sarah intentionally. Still, that’s gotta hurt. No worries, no worries. You’ve gotta realize that when you’re a parent you see this happening with your own kids. Same thing here. Relationships either die or get stronger. Doesn’t make it less painful to watch. Well, as usual I’m leaving 3 posts at once… Who’s the girl Sarah is talking to here? That’s Emily Shumaker who first showed up in https://aaronmizuno.deviantart.com/art/Circle-of-Friends-281054467. I’m fairly sure I haven’t named her in the actual story yet, and I keep thinking her name is actually Erika, so… it might shift to that? I kinda like “Erika” more than “Emily” but that’s because Erika seems to fit the group dynamic more. Yeah, I’m digging it more as well. The comment thing bugs out on me from time to time as well. Um, not to be scratching at nits, but are Amanda and Erika/Emily related? In the deviantart posting it’s Amanda Tenebrik, but in the Mastery thumbnails it’s Amanda Shumaker. Did you rejigger the names a bit? I notice Julie went from “Tress” to “Pride” as well. Erika Tenebrik doesn’t work as well as Erika Shumaker and/or Emily Tenebrik. Dude, I really like that group photo. Hmmm, the reply-thingy seems to be semi-broken. Totally aren’t related. More old-version, in-progress, and revision stuff. According to my most recent script, Erika is Erika Tenebrik. Amanda is the Shumaker. I went to high school with a Shumaker. I don’t really remember much of her, but I always thought the spelling was kinda neat. I’ve always seen “Shumaker” as “Schumaker” so yeah, I like the spelling better.